Our Verdict: One of the pioneer e-liquid manufacturers in the US, My Freedom Smokes started out as a modest business, growing and expanding as its e-liquid enjoyed massive popularity. Offering high-quality e-liquid that is flavorful and capable of massive clouds, it’s no wonder why many users consider them to be one of the best. They are perfect for both sub-ohm tanks and vape pens. 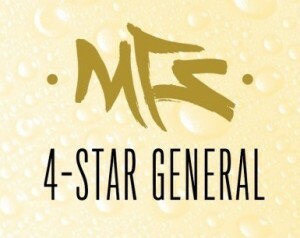 A favorite among regulars, 4-Star General is based on the famous and popular RY4 blend. It has a tasty tobacco flavor with sweet highlights. It simulates the taste of real tobacco very well and the addition of a touch of sweetness makes it a great everyday vape. Another fan favorite, Blueberry Waffle tastes exactly as its name promises: rich waffle flavor with a hint of maple syrup, combined with a side of blueberries. A great breakfast vape, if ever there was one. Mixed and developed in-house, Fruit Punch is not your usual fruit punch flavor. Users might expect it to taste like regular fruit punch, but this version has an unusual fruity flavor that’s not too sweet, but sweet enough. It has a more dominant tart flavor to it than other sweet fruits. A smooth and rich tobacco vape with cool menthol, Mass Menthol is perfect for menthol cigarette lovers looking for a vaping alternative. It’s a great vape for staying cool, even on the hottest of days. A fruity liquor-based flavor from My Freedom Smokes’ Premium line of e-liquid, BlackBerry Brandy combines the familiar tangy taste of blackberry with relaxing brandy. It’s a great after-dinner or evening vape to cap off a stressful day. Brand: My Freedom Smokes started out as a small business back in the early days of vaping. As one of the pioneering companies offering US-made e-liquid, the brand grew and quickly became one of the top names in the industry. They have an online store that sells everything; from starter kits to advanced mods, wires for rebuilding to cotton for wicks, and of course, e-juice. The company boasts that its store has something for everyone. And from the look of things, they really do. 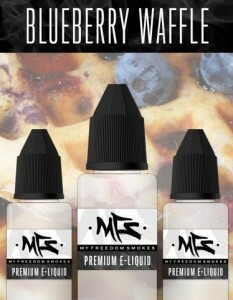 While My Freedom Smokes have their own starter kits, their main product is their line of e-juices. With over 200 flavors available in varying degrees of nicotine strengths and PG/VG ratios, everyone, from flavor seekers to cloud chasers, is catered to here. It’s no wonder they are considered to be one of the top e-liquid manufacturers. Bottles and Flavors: My Freedom Smokes E-Liquid comes in standard plastic bottles that are available in sizes ranging from 10ml to 500ml. The quality of the bottles is good and they have standard nozzles attached. They do offer replacement bottles, drippers, and thin-nosed tips for those who need them. Overall, the bottles are tough enough to transport and have child-proof caps, as well. My Freedom Smokes also has a variety of PG/VG ratios, depending on user’s tastes. The PG flavors have a ratio of 80/20 PG/VG and the VG flavors have a ratio of 20/80 PG/VG, while the Subjuice line has a maximum 100% VG content, which is perfect for sub-ohm users. Nicotine levels also run the gamut of strengths: 0mg, 6mg, 12mg, 18mg, 24mg, 36mg, and 48mg are all available to users. It is a good range that caters to vapers of varying tastes. 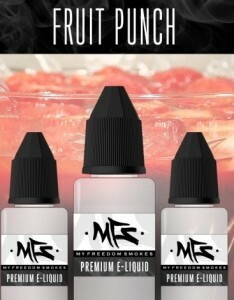 Flavors from My Freedom Smokes’ Subjuice line only come in 3mg. The flavor groups available are also well represented. These include: tobacco, fruit, candy, dessert, drinks, mint and menthol, as well as other flavors. All flavors are available in both VG and PG dominant e-liquid. Vapor production varies, depending on the PG/VG ratio. E-liquid with a ratio of 80/20 PG/VG will give more intense flavor and decent vapor. For 20/80 PG/VG ratios, flavor will be more muted, though cloud production will be substantially more dense. For the Subjuice line, which is the maximum VG, clouds will be at its most dense, which is great for both sub-ohm users and direct inhalers. My Freedom Smokes offers high-quality e-liquid at very affordable prices. For US-made e-juice, they still compete with the pricing structure of Chinese-made versions. That alone is very impressive. While the company uses American-made ingredients, they also use European ingredients. This is because European flavor companies have certain flavors that are not available in the US, but these are just raw materials. The actual mixing and manufacturing happens in the US at My Freedom Smokes’ state-of-the-art, in-house facilities by professionally-trained flavor experts. Ingredients are all FDA-approved and strict quality control is implemented at all times. This makes for high-quality e-liquid that only few can match, let alone surpass. With a staggering list of flavor options, a healthy range of nicotine levels, and flexible PG/VG ratios, there’s little doubt that My Freedom Smokes is one of the premier e-liquid manufacturers on the market today. E-juice enthusiasts with tastes ranging from simple and basic flavors to more complex and exotic flavors will surely have their fill with My Freedom Smokes. Users, who are not convinced, can order sample packs in different flavors of their choosing, but even then, there’s little chance they’ll hate it.